Michael Smith scored the only goal as League Two play-off chasers Portsmouth won against Carlisle United. 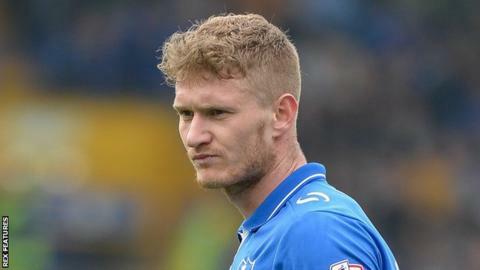 Pompey broke the deadlock when Carlisle goalkeeper Mark Gillespie parried Kyle Bennett's shot into the path of Smith, who made no mistake from close range. Adam McGurk had two chances to make it 2-0, first hitting the post and then having Danny Grainger block his shot. Carlisle could have earned a point but Hallam Hope could not find the net from Derek Asamoah's cross. The result means Portsmouth remain in sixth place in the League Two table, while Carlisle slip two places to 11th. "It is always great for strikers to score. Smith has worked hard to get that little bit of luck and to get that goal today. "The lads know what is expected; the work ethic among the lads is top class. We started the second half with intent and with tempo so we were unfortunate not to go two up. "We are trying to get momentum, trying to gather pace and hopefully we can claw a few points back to try and get in the automatics and cement a play-off place." Match ends, Portsmouth 1, Carlisle United 0. Second Half ends, Portsmouth 1, Carlisle United 0. Substitution, Portsmouth. Gareth Evans replaces Kyle Bennett. Attempt missed. Alex Gilliead (Carlisle United) right footed shot from the centre of the box is just a bit too high. Attempt missed. Michael Smith (Portsmouth) right footed shot from a difficult angle on the right is just a bit too high. Substitution, Portsmouth. Marc McNulty replaces Adam McGurk. Substitution, Portsmouth. Kal Naismith replaces Gary Roberts. Attempt missed. Derek Asamoah (Carlisle United) right footed shot from the left side of the box is close, but misses to the right. Attempt saved. Michael Smith (Portsmouth) right footed shot from outside the box is saved in the centre of the goal. Attempt saved. Kyle Bennett (Portsmouth) right footed shot from the left side of the box is saved in the centre of the goal. Attempt saved. Adam McGurk (Portsmouth) right footed shot from the right side of the box is saved in the top left corner. Corner, Carlisle United. Conceded by Matthew Clarke. Substitution, Carlisle United. Jabo Ibehre replaces Mark Ellis. Foul by Gary Roberts (Portsmouth). Tom Miller (Carlisle United) wins a free kick on the left wing. Gary Roberts (Portsmouth) wins a free kick on the left wing. Corner, Portsmouth. Conceded by Danny Grainger. Kyle Bennett (Portsmouth) wins a free kick in the attacking half. Substitution, Carlisle United. Derek Asamoah replaces Brandon Comley. Gary Roberts (Portsmouth) wins a free kick on the right wing. Attempt saved. Gary Roberts (Portsmouth) right footed shot from the centre of the box is saved in the centre of the goal. Corner, Carlisle United. Conceded by Adam McGurk. Substitution, Carlisle United. Alex Gilliead replaces Jack Stacey. Goal! Portsmouth 1, Carlisle United 0. Michael Smith (Portsmouth) right footed shot from the right side of the six yard box to the bottom left corner. Attempt saved. Kyle Bennett (Portsmouth) right footed shot from the left side of the box is saved in the top centre of the goal.